Whether you’re herping or trying to get a snake out of your backyard, preparation is key when it comes to dealing with snakes, especially if they’re venomous. Firstly, you want to make sure that you aren’t in harm’s way, which means you should be prepared with the best snake hook. Secondly, and as many would consider more importantly, you want to make sure that you’re not harming the snake. Snakes are delicate creatures and if you’re not careful when using snake hooks and tongs, it becomes easy to break their spine. In this guide, we’re looking at high quality snake hooks for handling and dealing with snakes of all kinds. We’ve scoured the internet, looking at countless first-hand snake hook reviews and have compiled a list, not necessarily definitive, of some of the ones which came out on top every single time. When Should You Use a Hook? Are Snake Hooks Best for Small or Big Snakes? 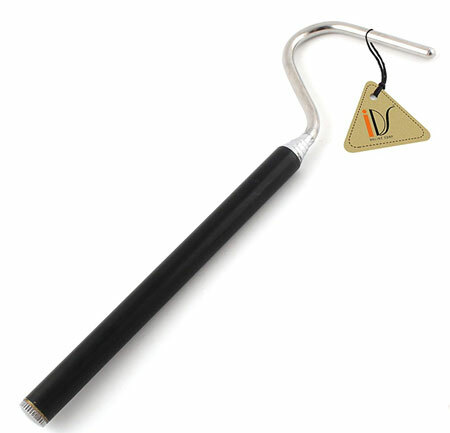 Currently, this is one of the top rated snake hooks on the market, sitting at an impressive 5 stars on Amazon. It has been named the ‘Copperhead Series’ because the ferrule (attaching the hook to the shaft) has been made from copper, making it lightweight and very well-balanced. On top of that, a stainless steel construct gives it the durability you’d expect from a snake hook, allowing it to handle heavier snakes with ease. You tend to find that many hooks are built with aluminium which is great for keeping it lightweight but it isn’t as strong as stainless steel and can corrode more easily over time. The rubber hand grip has been specifically designed to remain lightweight and comfortable. This, as well as the design of the hook, facilitate safe snake handling while having the right amount of control over its movement. 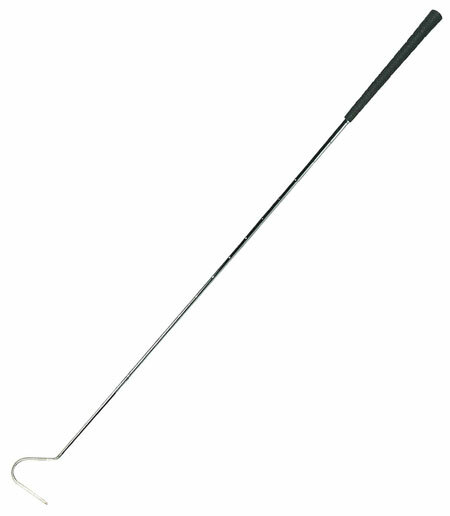 At 40 inches in length, this snake hook provides you with a good amount of control over the snake as well as keeping you at a reassuringly safe distance. The construction of the device is lightweight and durable, both qualities you would absolutely expect from any high quality hook. Although functionality outweighs style when it comes to snake handling, the minimalistic design is elegant and will not be a worry point for any potential buyer. The shaft is somewhat comparable to a golf club, according to one online reviewer, suggesting that this packs a punch far beyond just design. Many hooks are used for flipping rocks or bush, not just moving snakes, and you could expect this one to hold up well if also used in such a way. The last thing you want is your hook to fall apart when you’re holding a snake. This is a standard snake hook, coming in at just over 44 inches which is a decent length before it becomes too hard to control a snake. 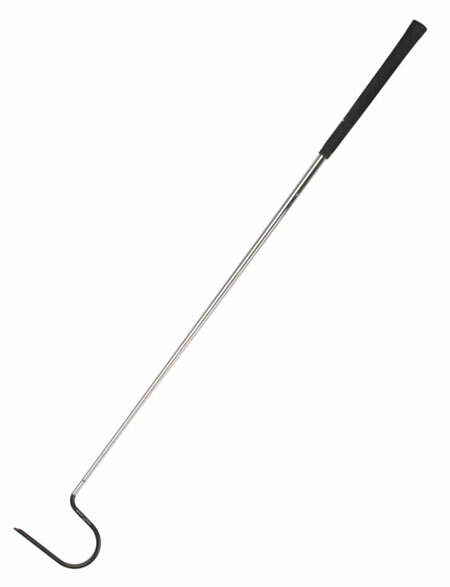 The shaft (which is essentially a golf club) of this excellent product is constructed from a sturdy chrome-plated steel, providing adequate durability. Furthermore, the hook itself is made from stainless steel which means that it will hold up incredibly well with a snake on the end of it. The rubber grip and the holding end has been designed to be non-slip which is ideal in wet (or sweaty) conditions. You tend to find that lower-end snake hooks can become slippery and worrying about whether or not you can hold it properly should be the least of your concerns. We’ve thrown this product into the reviews to give a very cheap option for those who will be only handling small snakes. Remember, it is not recommended to use a retractable/collapsible reptile hook for larger snakes as they are prone to breaking. This is especially true if you use it for turning logs and rocks. This length of this product is relatively short which is perfect for having good control and great for small snakes and hatchlings which pose little threat. Although it is retractable, it is made from stainless steel, meaning it is durable for what it is. Being collapsible means that you can transport the hook far more comfortably, fitting into backpacks and under seats with ease. At its longest, it measures 25.98 inches and at its shortest, it comes in at 7.13 inches. Snake hooks are considered as an essential piece of gear for any amateur or pro snake handler. They’re designed to keep you and the snake safe. They allow you to keep your distance from a snake and not have to use your hands yet you’re still able to maintain a good level of control over the its movement. That said, as simple as snake hooks look, they come in all sorts of shapes and sizes which can affect the way they perform. For example, a longer hook will give you more distance from the snake but it will mean that you have less control. The reverse is true when we talk about small snake hooks; you’ll have much better control but you’ll be closer to the snake’s head. There are several instances in which using a snake hook can put you at a great advantage and we’re going to take a look at the situations people use them most often. Hooks are a critical tool when it comes to transferring enclosures e.g. if you need to clean one. If you own multiple snakes, then you’ll already understand that moving them happens often and a hook will quickly become your best friend. It allows for you to move a snake safely, while keeping it calm. Those who study snakes spend a lot of time out looking for them in their natural environment and those snakes tend not to be as accustomed to being handled by humans. 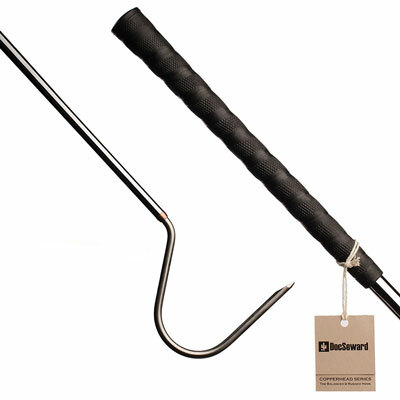 Not only is the hook excellent for controlling a snake but it’s also really useful to move vegetation, debris, and logs to minimize the risk of being bitten. Just like tongs, hooks are often used to pin the back of the snake’s head. You need to be careful here, though, as some hooks are designed for this and can actually be harmful to the snake. Usually, a good hook for pinning is one that has a flattened section by the tip. As great as hooks are for capturing a snake, they’re equally good for releasing snakes safely to the wild. Often a snake is caught by a herpetologist in order to study it and it is then released back to its natural ecosystem. Many believe snake hooks are absolutely vital when you’re dealing with large, aggressive, and venomous snakes and we have to agree. However, they’re often thought of as not so important when you’re handling a small and less aggressive snake. One of the main reasons for this is because it is much hard to hold a small snake properly with a snake hook as it’s very easy for them to slip off. In fact, unless the small snake is very calm and not wanting to move, then you’ll do a good job of keeping it balanced on the hook. For large snakes, however, you can use a hook more easily to scoop its belly which makes it very hard for it to move and strike since there is no leverage for the snake. Unlike on the ground, when a large snake is sitting on a hook, there is very little for it to push from to strike, which is why using a hook makes handling much safer. Of course, it is possible for a determined snake, even a large one, to wriggle off the hook and this becomes truer if you don’t position it properly under its belly. One of the best ways to use a snake hook is to use it with snake tongs. Tongs are most commonly used to control the first third of the snake’s body, near the back of the head. However, this leaves the rest of the body to move around. At this point, you should use a hook to support the lower half of the snake. If using the hook alone, aim to scoop the snake around the middle of its body, or maybe even slightly closer to the head than middle. This will support most of the weight and will give it very little leverage for striking. There are a couple of instances where pinning a snake with the hook becomes necessary. Firstly, if you don’t have tongs at hand, then a hook can be used to pin the back of the head and then you can use your hands to gain control. Secondly, you might accidentally pin the tail of the snake with tongs and then have to use the hook to pin the head. Make sure if you’re aiming to pin a snake with a hook that you don’t use a collapsible hook. They’re becoming very popular and are made primarily for ease of transportation, however, they aren’t a suitable for pinning snakes down as they are for supporting their body. Hooks are designed to support and lift rather than pin. The extra pressure or stress on the joints of a collapsible hook will weaken them over time which can be dangerous if you then have to handle a particularly strong or aggressive snake. Given the option, it’s better to opt for a strong and stable hook over a collapsible/extendable one. As well as handling snakes, people inadvertently end up using hooks to move logs and rocks while out and about, which would be the end of a flimsy collapsible hook. There are certain species of snakes which are hugely popular as pets because of their usually calm temperament. Generally, they're very reluctant to bite and their size makes them easy to handle. However, it isn't unknown for a corn snake, or any other species, to become aggressive, so it's important to know how to handle it in this instance. ​Most of the time, a snake will strike in a defensive manner. This is when it has been given a fright or feels threatened by your actions. Firstly, you should try to figure out what is agitating the snake and aim to remove or reduce the cause. It could be that you're moving too quickly or surprising it in some way or it could simply be a household pet scaring it. If your snake is consistently aggressive over time, getting bitten is a fact you're going to have to face. The more scared you are of being bitten by your pet, the more timid your actions will be and the snake will react accordingly. Confident and assertive actions yet not rushed are key to a smooth handling experience. If you've just got a new pet snake or already own an aggressive one, then tap training might be for you. Tap training, or 'conditioned emotional response'​, is a highly effective technique which is implemented to allow your snake to get used to a hook and distinguish between feeding and handling times. ​The training is relatively simple but effective and there are two main ways to do it. The first is to gently tap to the side of the terrarium with the hook. The idea here isn't to startle the snake at all but to make it aware of your presence and let it know that it's handling time, rather than feeding time. The other method of tap training is to gently tap or stroke the snake's nose with the hook or your hand. By doing this every time you go to handle or move the snake, it will begin to understand that there is no need to strike you. Over time, this will make it much easier for you to go into the enclosure during cleaning times or when you simply need to move your snake. The key is to make sure that you don't touch your snake when it comes to feeding them. By keeping these technique separate, your snake will soon get used to understanding that there is no food available if it has been touched. To the unenlightened, it might seem like there isn't much depth to field herping. To us, one of the most exciting things about it is how many techniques are involved in order to have a successful herping trip. It's a skillful activity that requires plenty of patience and a great awareness of your surroundings and snake behavior. Not only are there the specific techniques to finding snakes such as flipping debris or removing bark from trees but you also have to be conscious of the weather, time of year, and some even argue that moon phases play a crucial role! This is one of the most fundamental skills to learn for any herper and its a reason to make sure you have a solid, well-built hook. You can flip virtually any natural hiding place, such as rocks, logs, leaves, and even artificial hides like trash and wood piles. You need to take care and put yourself at a distance when flipping since you never know what's going to be under the next rock. For those new to the game, this technique might not yet be on your radar but it can be effective. Snakes, like the milk snake, and other small animals enjoy to hide among the bark of fallen trees. You can use your snake hook (or any other similar item) to rip the bark from a tree and discover what is hiding underneath. The great thing about road cruising is that you can cover a large area in a short time. The aim is to drive through remote areas at a slow speed and see what you can find. Dusk and dawn are particularly good times to go road cruising as well as spring and fall. Hiking in habitat requires a bit more preparation and planning. You'll need to figure out which snakes you're looking for and research their natural habitats. You'll need a lot of patience with this method since you might have to cover large areas before you see anything. Snakes tend to stay off the beaten path - keep this in mind. Your best chance of spotting anything is always going to be around dusk and dawn, just as the sun is either rising or falling. The reason for this is because that's when snakes and herps are most likely to be out hunting for their next meal. That said, many snakes, like the cottonmouth, enjoy basking out in the warmth of the sun so you're best to do your research. There are mixed opinions on how moon phases affect snake and herp activity levels. Some research suggests that certain nocturnal species are highly active during new or full moon phases due to the greater light. It's worth experimenting with to see if it works for you.